For the past three years, I’ve held off on “mom” jeans. Sure, I’ll dabble in “mom” denim shorts, but a full pair of jeans? Too trendy. I didn’t want to look like another Alexa Chung/Camille Rowe/Jeanne Damas hybrid clone. 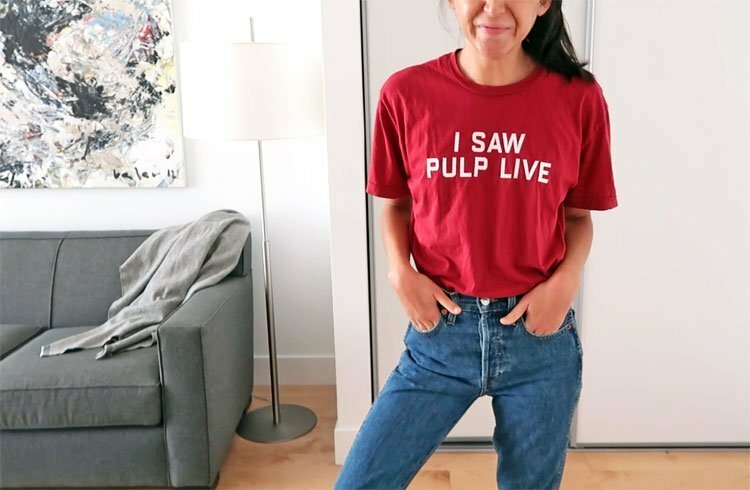 You know the kind who drinks green juice while puffing on a cigarette, has a collection of vintage tees that rivals your uncle in Minnesota’s and who has that perfectly disheveled windswept hair (i.e. indie Disney princess hair)… so I abstained. I’m 5’5.75” and weigh 115-117lbs in these photos. My Re/Done Original Double Needle Crop jeans are a size 25… a size down from my APC jeans and a size up from Rag & Bone jeans. These jeans fit like a glove and don’t require any breaking, unlike raw denim. While nearly perfect, they’re a bit loose around my thighs. This could be due to my flatter bum though. “Fabric Content”, at 100% cotton, my specific Re/Done jeans, the Double Needle Crop, do not have any stretch. They might stretch out over time, but as it stands, they don’t have a lot of give. This is why I went with a size 25. They fit basically perfect now with a bit of a pinch around the front. “Front Rise” means the measurement from the bottom of the crotch to the top of the waist. The 11” means that these jeans are high waisted. For comparison, most regular jeans are 8.5”. My Re/Done jeans come up right to the bottom of my belly button. The higher waist/front rise not only means more comfort (are high waist jeans the most comfortable jean ever? ), but they also make your legs look longer because it changes where your perceived waistline is. “Inseam” is basically the length from the bottom of the crotch to the ankle, down the inside of the pants’ leg. The 28” inseam means that if you’re 5’5.75”, like me, these jeans will be the perfect length and not require a hem. “Leg Opening” is pretty obvious, but that’s the hole that your foot will go through, i.e. the ankle circumference. The number here, 12″, shows that it’s wider than a classic skinny jean ankle (usually skinny jeans are 11”), but still relatively skinny. Where trendier jeans, ahem GRLFRND, have a flimsier feel, Re/Done’s Original jeans do not. My GRLFRND denim skirt was sorely disappointing. The jeans felt too new, almost slick — they didn’t feel like real denim. While this denim still feels new, it has more weight and less of a “new new” feel. Re/Done’s original jeans have five real pockets that are deep enough to hold your whole hand. This is important to note after a pair of Rag & Bone jeans had “imitation pockets.” What a bummer those were — what do I do with my hands?? However, Re/Done offers free repairs on their jeans for life. All you need to do is pay for the shipping and return shipping — a good deal if you’re based in the US and use USPS. When Re/Done came onto the scene, they started by reworking old Levi’s denim. This bothered me. I am a What Goes Around Comes Around (WGACA) loyalist… and they did it first. My favorite denim skirt in the whole world (that has been repatched several times) is from WGACA’s vintage Levi’s line. So when Re/Done started the whole “vintage Levi’s” thing, I was annoyed. After their success with reworking old Levi’s, they created their own line of “original” denim. … not a bad idea considering their vintage Levi’s jeans was notorious for inconsistent sizing and wash. A sales associate at Barneys told me that folks would come in every day to exchange their jeans because they hated the wash they were sent. While Re/Done’s Original jeans are not as ~authentic~ as a pair of their Levi’s jeans, they are more consistent in wash and size. … as seen on my Instagram — super humble. –Length: No hemming required on 5’5.75” me. –Weight: A heavy weight makes them more likely to stand the test of time. –No Stretch: They make a stretchier version, but I wanted no stretch. This pair definitely don’t stretch. –Wash: My Re/Done Originals’s wash is called “Seventies AF.” I cannot get enough of this wash. It’s the colour of your vintage Levi’s dreams… only they’re new. –Comfortable AF: These jeans are absurdly comfortable while stylish at the same time. –Not Tight Enough: It could just be flat-bummed me, but these jeans are a little big around my thighs and bum. A smaller size would make the “V” shape at the crotch more pronounced — no bueno. –Button Closure: Sure, it’s more “authentically vintage” to have a button fly closure, but zips are so much easier. … but I’ve found the Holy Grail of mom jeans that makes me feel like the Indie Disney princess of my dreams. Re/Done jeans are available from $200+ USD at a wide variety of retailers or from my code (I’ll also get 20% off, FYI!). … and here’s the link to my exact pair, the Double Needle Crop in “SAF” for $225 USD. Note: These are affiliate links which costs you nothing… but means the world to me & newinspired. When you use these links, the money newinspired earns gets reinvested in blog content. Absolutely nothing on newinspired is “gifted,” I purchase each item with my own money. Affiliate commissions are used to purchase new items to honestly & thoroughly review. If you find this review helpful, consider using them to support newinspired. -While I tried them on at Barneys, I bought them on SSENSE. A week later, they went on sale. I emailed customer service and because they were still in stock in my size, they refunded me the difference. TLDR: I highly recommend SSENSE.